Successfully Added WiFi Car DVR - 1080p Video, 170-Degree Lens, App Support, G Sensor, Built-In Microphone, WiFi to your Shopping Cart. 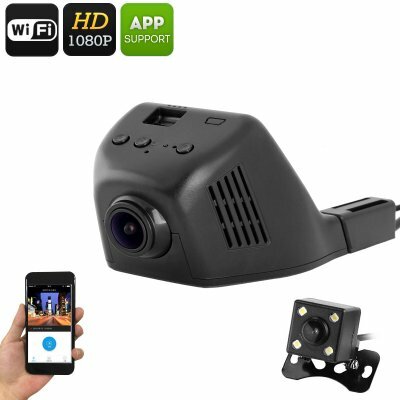 Supporting an ultra-wide viewing angle of 170-degrees, your car DVR will capture not only that’s what happening on the road but also what is going on next to the street. This car gadget treats you with crisp 1080p images which are highly detailed. Therefore, you’ll be able to recognize even the slightest details when watching back previously shot video. Thanks to its loop recording, your car accessory will shoot short 1, 3, 5, or 10 minutes videos that will automatically overwrite the previous one when nothing has happened. This will make sure that you won’t fill up your 32GB or storage with unnecessary images. With its G-sensor, your car DVR will automatically save the recordings of a potential accident to make sure you’ll never lose your evidence material. Your car DVR is powered straight through the power supply of your car and will turn automatically on when you start your vehicle. This brings along greater efficiency and safety while using your car accessory as it does not feature a built-in battery. Both cameras bring along great safety on the road and are sure to improve your overall driving experience. The rear view parking camera that is included in the package furthermore makes driving in reverse and packing your car backwardly easier. From now on, you’ll always be able to park your car in reverse without ever needing to turn your head. Simply attach your smartphone to your dashboard, connect it to your car DVR and parking camera, and you’ll be treated to crisp images all throughout your trip.